Skip the common names: As much as you love the name Emma or anything ending in an ‘aden’ your child is at risk of being among many. Before you name your child, check out baby name lists and see what names are trending and avoid them. You do not want your child to always be known as ‘Emma S.’ to different her from the other 3 Emma’s in her class. Give them their individuality but giving them something that is not popular and so common. Family names: Family names are a wonderful way to honor and keep the family name going. They often have more meaning than most and become something that your child proudly embraces as they get older. Watch for nick names: Once you have made a list of names you like for your child spend some time trying to find nick names that can come from it. Children are creative and no one’s name is ever 100% safe from nick names but at least you can avoid the obvious ones. Make a list: Make a list and feel free to add and take off as you get closer to your decision. Try using the names you like in your daily life to see how it feels and sounds. 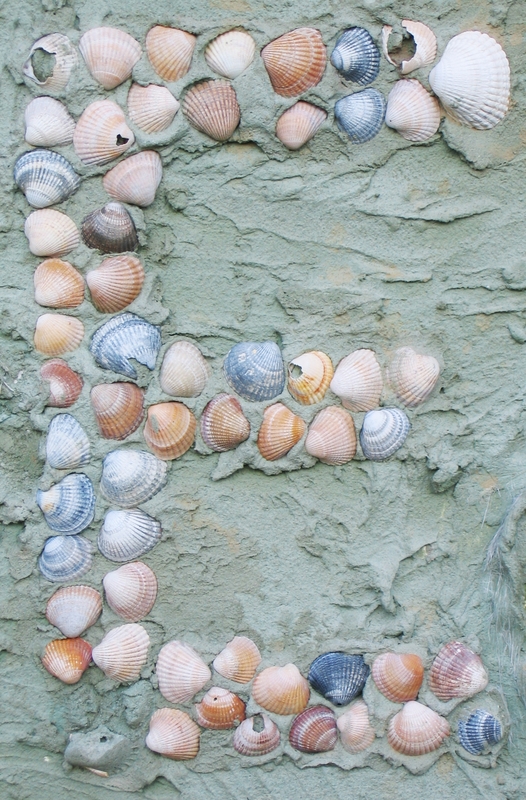 Find the meaning: Naming your child a name based on its meaning is very special. If a name’s meaning means something to you, be sure to research the different meanings. A popular name is Kennedy and the meaning is ‘deformed head’. Keep it on the down low: Not everyone is going to like the name you choose for your child and they are entitled to that opinion. However if you find a name that you really like, don’t allow someone’s personal opinion change that for you. Keep the name to yourself to prevent changing your mind last minute. Today’s guest post comes from Nanny Pro. Thank you! New parents like to think of their baby’s nursery as her safe haven, and that her sleep will always be peaceful and free from danger. This is, however, not always the case. While sleeping might seem like a risk-free activity for a baby, the truth is that there are some factors that parents and caregivers must take into consideration in order to protect the safety and well-being of the precious little one in their care. The internet is home to what seems like an endless stream of blogs, many of which are dedicated solely to parenting and childcare topics. These blogs can be a treasure trove of valuable information on sleep safety; here are 30 that feature sleep safety and related posts very prominently. During the first few months of her life, your baby will spend a significant portion of her time sleeping in her crib. Because this small space makes up so much of her world during this period, it’s important that you educate yourself as thoroughly as possible on how to keep it safe and secure for her. 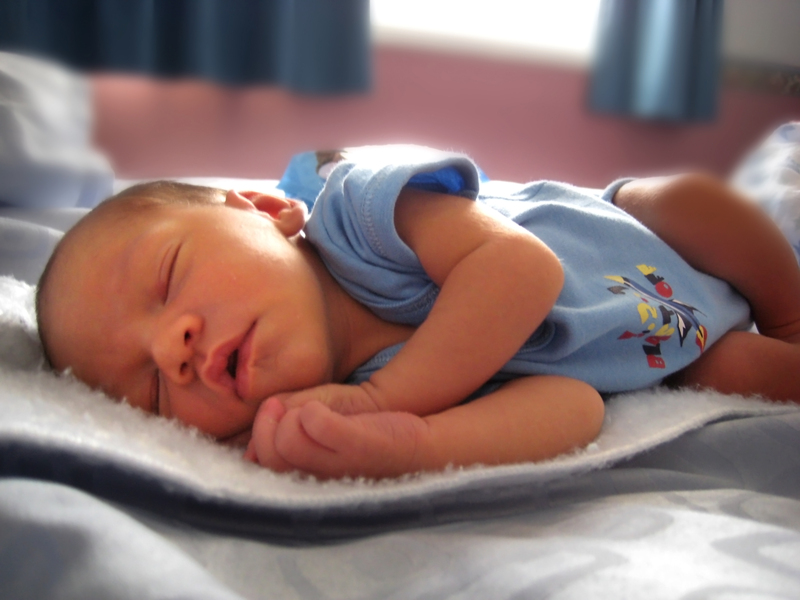 Few things are as terrifying to a parent as the idea of SIDS, or Sudden Infant Death Syndrome. While the exact cause of SIDS is still unknown, the number of unexplained infant deaths has dropped considerably since 1992, when the American Academy of Pediatrics released findings that babies who sleep on their backs tend to be at a lower risk than infants who regularly sleep on their stomachs. For such a small piece of rubber and plastic, pacifiers sure have been known to drum up a lot of controversy. Parents and caregivers who find the devices to be valuable comfort objects sing their praises, while others swear that they affect the formation of a baby’s mouth and increase her risk of needing expensive orthodontia as she gets older. Recently, however, studies linking pacifier use to safer sleep and a reduced risk of SIDS have brought the binky back to the forefront of parenting debates. Pacifiers Protect Against SIDS, But What About Breastfeeding? The safety of your little one’s nursery can affect not only how safe she is when she sleeps, but also how safe she’ll be as she gets older and spends more alert time in her room. 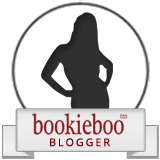 Creating a secure environment for your new baby to grow and learn is a popular topic for bloggers; these posts cover the spectrum of opinion and personal experiences. Establishing a safe sleeping routine for your baby requires that you make sure that how and where she sleeps are both in accordance with safety guidelines, regardless of what time it is or how much sleep you’ve missed out on. Bedtime Routines: The Key to Sound Baby Sleep! Despite the American Academy of Pediatrics’ strong stance on soft bedding, plush toys, and crib bumpers, some parents insist on using these items for their baby’s comfort. Crib bumpers, in particular, have been banned by the city of Chicago, but are fiercely defended by parents who feel that they protect a baby’s head from injury. Crib Bumpers — Yay or Nay? While the web can be a vast sea of useful and accurate information, no blog post replaces the professional opinion of your pediatrician or family doctor. Be sure to consult with a healthcare provider before making any changes to your child’s routine in order to ensure that all advice you’ve received is accurate and medically sound. Should You Put Rice Cereal in Your Baby’s Bottle? Finding the perfect nanny is important. Finding the childcare provider that is right for you can be a difficult task. First, you have to figure out if you want to go the day care route or the nanny route. Then, once you chose to go with a nanny, there are all kinds of questions to consider. What do you need from a nanny? What do nannies really do? How much should you pay your nanny? These questions are common to new parents. First of all, you need to figure out what you are really looking for. Do you need a short term provider, just to help you out during your child’s infant phase? If so, you may want to look into a special kind of nanny called a newborn care specialist. They stay with you during the difficult first weeks and guide you on the best and safest ways to take care of your child. If you are looking for a more long term solution, then you need to think about what you want the nanny to do. Do you need them to preform light housework, like cleaning up the child’s room or doing the child’s laundry? Do you want them to teach the child or feed the child in accordance to your lifestyle choices? Does the nanny need to also be able to help the child with homework or teach them multiple languages? All of these types of questions will determine what you are looking for in a nanny. Once you have figured out what you need the nanny to do, then you need to decide if you want a live in or live out nanny. Do you need them to be accessible 24 hours a day, or just during working hours? Do they need to provide their own transportation? Do you have room in your home for a live in nanny? If you do not have set hours, are you willing to pay overtime? Do you need the nanny to work weekends? These are all relevant questions that you need to answer before you start looking to hire a nanny. As for the pay, it really depends on the situation. If the nanny is a live out nanny then you need to pay at least the minimum wage in your area. If you provide food and shelter, you may be able to pay a little less. The main thing is to offer comparable pricing to the employment opportunities in your area. You will also need to keep in mind that extra work means extra pay. If you want your nanny to be educationally or lingually qualified, you need to be prepared to pay more. Also, housekeeping duties usually call for additional pay. If your child has special needs, you may want to find a nanny with training or experience. This will also usually cost you more. The main thing is to make sure that the nanny understands your needs before you ever hire her. A written contract is vital to assure that everyone’s needs are spelled out clearly before employment begins. After that, it is just a matter of finding the nanny that is right for your family. Kelsey is the editor in chief for findananny. 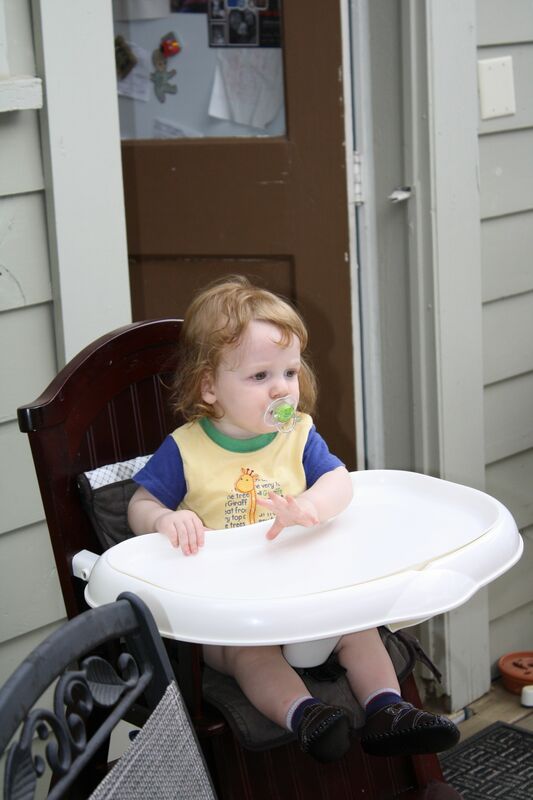 She loves to write article and ideas that parents & nannies would be interested in hearing. She helps society on giving information about nannies through nanny services. She is a professional writer & loves writing on anything. Today’s guest post is by Babysitting.net. It seems like these days everyone is always rushing around, working late, and struggling to cross things off a to-do list. Not surprisingly, this go-go-go mindset makes it’s hard for parents to meaningfully connect with their children. One way parents can nurture this relationship with their children is to express love in tangible ways. If you’re looking to foster connection and demonstrate love, consider implementing these 10 things into your day. Give her random hugs. Showing affection to your child is one way to connect with her on a physical level. Kids need a soft place to fall, and knowing that that place is with you will go a long way to make your relationship a close one. Dole out hugs often.Doing so can lead to a healthier and more emotionally well balanced child according to Dacher Keltner, a professor of Psychology at Berkley. Put notes in her lunch. When she is young, having a smiley face or some other sticker in her lunch is a fun surprise to find. Once she gets older and is able to read, you can send along notes of encouragement for an upcoming test or audition. Notes are an easy way to let her know that you are thinking about her. Bring her a balloon, just because. Balloons are so bright and fun that they always bring a smile to a child’s face. Little things that you can do to brighten her day will show her that you love her. Leave her notes on the mirror. The mirror is a good place to leave notes for a couple of reasons. The first reason is that everyone starts their day in the bathroom and will likely see the note which will create a good start to their day. Secondly, as kids get older they stand and look at themselves in the mirror and are often critical. Leaving notes that tell her how beautiful her eyes are or what shiny long hair she has will remind her of her assets instead of letting her focus on her flaws. Being told nice things first thing in the morning will definitely let them know they are loved. This is a good idea for working parents that may not see their child before they are off to school. Fix her favorite meal. Putting forth the extra effort to make her favorite meal will let her know that you care about her and that she is loved. Celebrate the little things like a lost tooth or winning student of the month. Bake her favorite cookies for an after school snack. Most kids will grab a snack right after school. Many times it will be something like fruit or some chips, nothing special. On a day when it’s rainy or when you know she’s been down, it’s a loving gesture to make her favorite cookies for a snack. Comfort food isn’t called “comfort food” for nothing. Take her for a special date night. Create a date night just for the two of you. Take her to the salon for a pedicure or to see a ballgame. Spending one-on-one time with her will give her time to share with you and for you to let her know how much you care about her. Tuck her into bed and sing her a lullaby. Yelling good night as she heads off to bed by herself isn’t as loving as walking with her to her room and taking the time to tuck her in and sing her a lullaby. Older kids may think that they want to be grown up, but especially in those tween years when they are caught between wanting to be a teen and wanting to still be your baby, tucking them in will be appreciated. Cuddle up with her to watch TV. Put in a movie, pop some popcorn and cuddle up on the couch to watch some TV. Doing so can serve as a time to relax and reconnect with each other. Special times like this will strengthen your bond and remind her how much she is loved. Today’s guest post is written by Live in Nanny which is a wonderful resource for families who are needing someone loving to take care of their children. Kids’ feet seem to grow overnight, so it’s important to be able to find the right shoe size at any given time. There are ways to keep up with growing feet and kids that seem to wear their shoes out faster than you can afford to buy a new pair. Here are a few tips for picking out the right size for your growing kids. Ask a specialist – When kids are young their feet are growing at a remarkable rate. This is also the time you want to make sure they are in the best shoes for their feet. Taking the kids to a children’s shoe store and getting them measured by one of the experts there should ensure that your child is going to get the right size shoes. 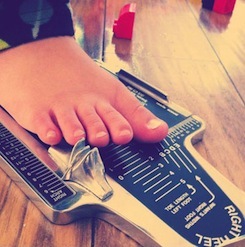 Measure often – Since kids’ feet grow so fast, it is a good idea to make sure they get measured a few times a year, especially when they are young. Too often kids end up with scrunched up toes because they don’t generally tell their parents when their shoes are getting too small. Kids will outgrow their shoes without parents noticing, so Mom and Dad need to be diligent and check the fit of their kids’ shoes every so often. Use a Brannock Device – The implement shoe salespeople use to size feet is called the Brannock Device, named after its inventor Charles Brannock. This device has been the standard for measuring feet since 1925. It measures both the width and the length of the foot. Make sure both feet get measured because sometimes little ones need special sized shoes, if both feet are not identical. Try on both shoes – Once you decide on the size, have your child try on both shoes. Sometimes parents will have the child try on one shoe thinking they both will fit, only to find out later that one shoe is too big or too small. Always buy with the larger foot in mind. Check for growing room – Some parents will press on the tip of the shoe to make sure there is a thumbs width between the toe and the end of the shoe. This simple guide allows a little space for feet to grow. Consider getting shoes a little larger – Getting shoes a size or half size larger will allow for growth between purchases. If you choose to do this, make sure your child can walk in the larger shoes without tripping and that don’t slide off their feet. Shoes that are overly large will be uncomfortable to walk in. Rain and winter boots should be larger – When buying winter boots or rain boots, it’s better to get at least a size larger to accommodate thick socks as well as growth. Keep in mind that stores don’t restock boots during the season, so once they’re gone, they are gone until next year. Some parents will get these boots even two sizes larger if they are expecting a growth spurt with their child. Just make sure your child is not tripping when walking in the larger size. Use a paper footprint – For some kids, trying on shoes is an ordeal and it becomes extremely difficult for parents. In these instances using a paper footprint may be a viable alternative to trying to get your kid to sit still and try on shoes. Have the kid stand on a piece of cardstock or thin cardboard and trace around their foot. Cut out the footprint and take it with you to the shoe store. Use the cutout to size the shoes and remember to leave a little room for growing. Measure feet later in the afternoon or evening – It’s a pretty well known fact that feet are larger toward the end of the day and this is the time you want to size up those feet. Doing otherwise could mean that your child will end up with uncomfortable shoes in the long run. Choose a size that fits well – “Breaking in” shoes is not really a good idea, and certainly not for children. Make sure the shoes you buy fit well and are immediately comfortable. Any stretching the shoe will do will accommodate growing feet. Picking the correct shoe size for kids doesn’t need to be a daunting task, but it is important. Proper foot growth is critical for children so be sure to check their shoes regularly for an accurate fit. It is better to invest more in shoes that will be worn every day than those that will only be worn for special occasions. 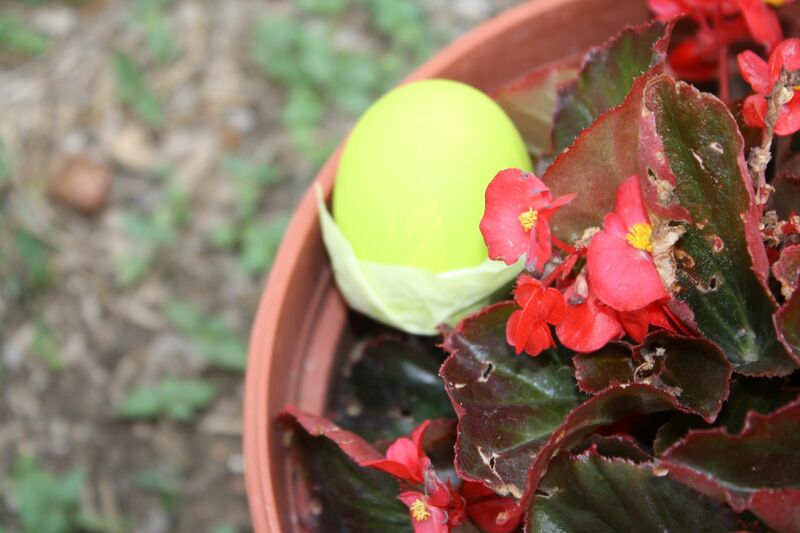 Easter is fast approaching; and with the flowers and trees blooming for spring, this time of year reminds me of our family tradition — coloring Easter eggs. As a child I remember my Mom picking up a PAAS Easter Egg kit and some Hershey’s chocolate for us to eat. I can still remember her boiling the eggs, the smell of vinegar as we gathered around the dinner table, taking turns dumping the eggs in the colored vinegar, all while savoring our chocolate. 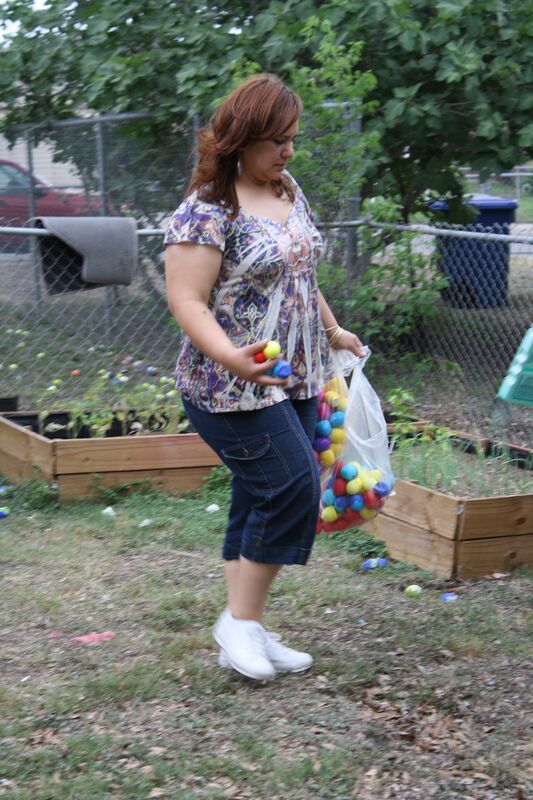 Then my siblings and I would run outside on a cool spring day and hide them around the yard so we could play hide and seek with those colorful eggs. This is one fun tradition that I’ve carried on for my family — coloring eggs and eating chocolate. However since we reside in South Texas, our Easter egg tradition has taken on a slightly significant Hispanic influence — the Cascarone. Firecracker preparing to observe the cascarones assembly. A Cascarone takes some advanced preparation. Since we’ve had Sunbeam we’ve joined his “Aunt Betty” and her family for Easter and with open arms they have introduced us to their Cascarone Chaos. An empty, yet clean egg shell -- ready to be filled. For months last year I carefully tapped dozens of eggs at the top, so I didn’t ruin the whole shell. Extracted the yoke and whites of the egg, washed it out, and placed it back in an egg container to dry out. I did this with 15 dozen eggs. Yes, 15 dozen. 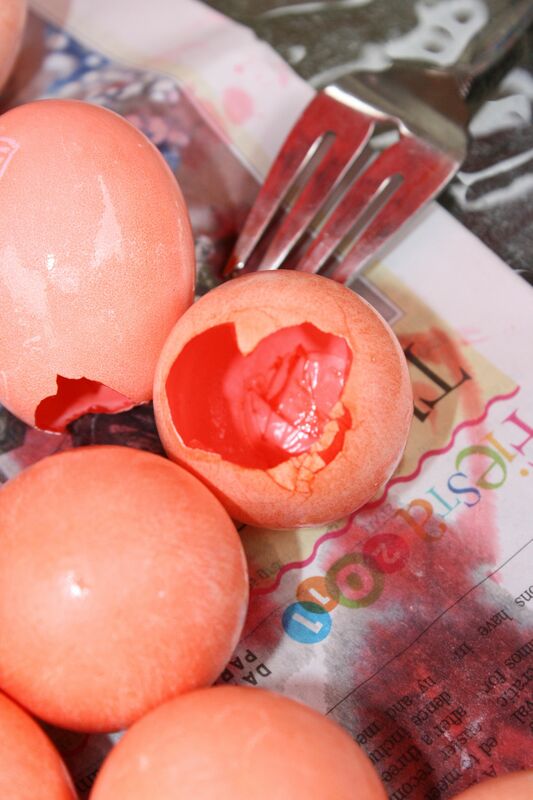 An inexpensive way to color eggs. 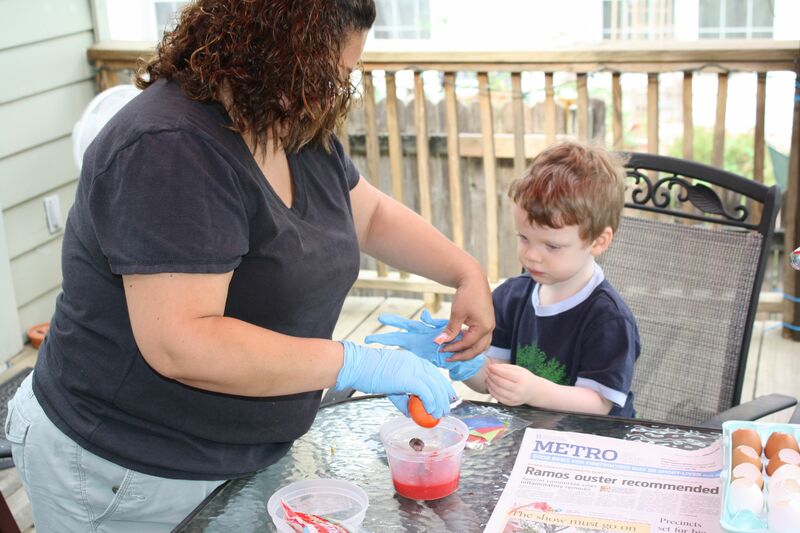 Then I learned something new — I didn’t have to use vinegar to color eggs. 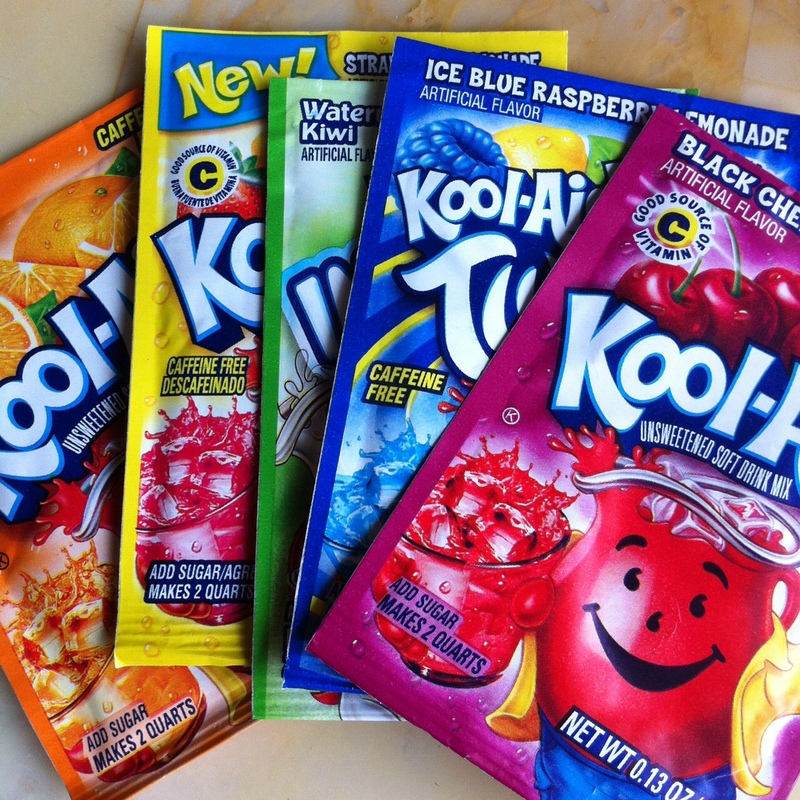 Apparently Kool-aid works just as well. Just as well with WHITE eggs shells. You receive a rather dull coloring job with brown shells. Lesson learned. 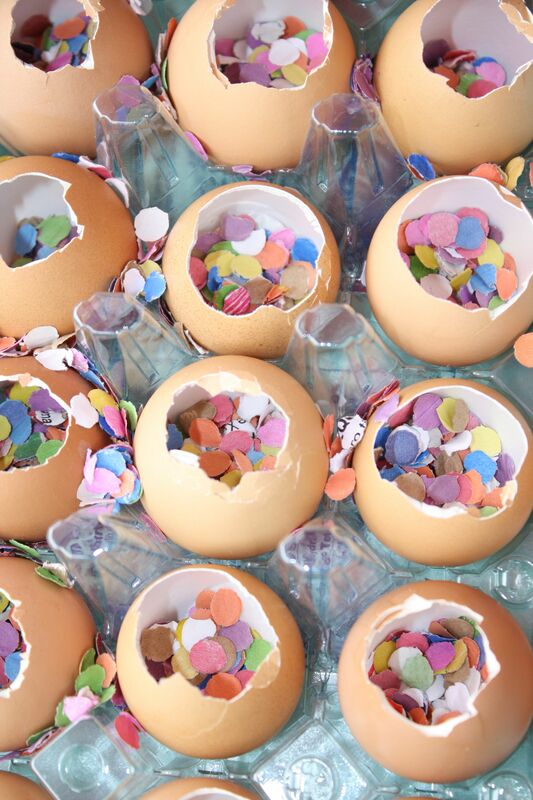 After the egg dries, then you fill the shell with confetti and glue a small piece of tissue paper. 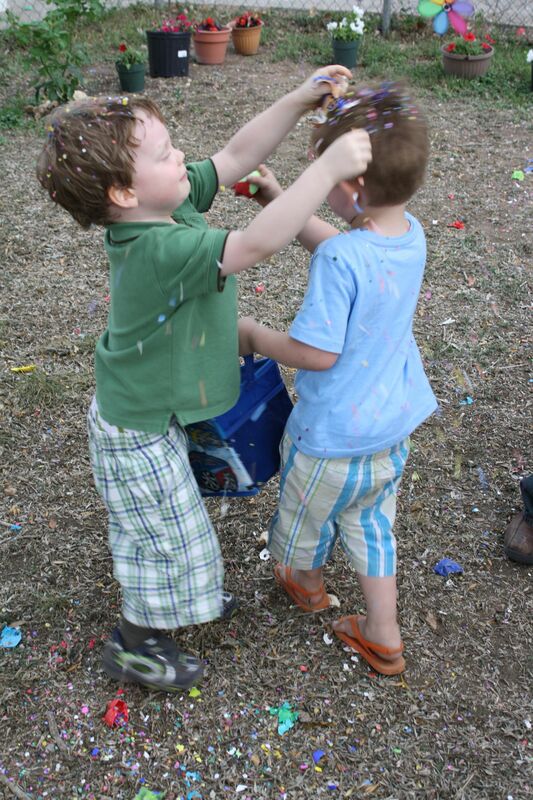 Then on Easter Sunday we join Aunt Betty’s family and hide all our combined cascarones (80 dozen or so) around the yard. 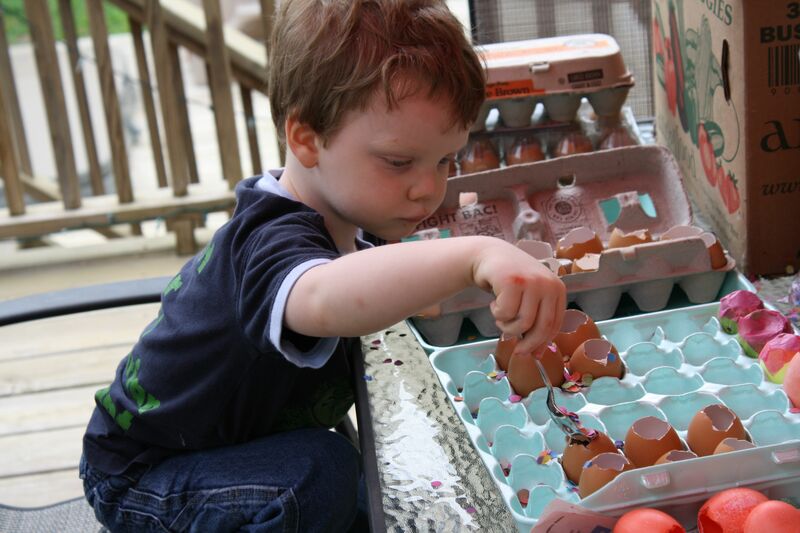 Honestly there are so many eggs that there is no hiding — only dumping them in the yard. 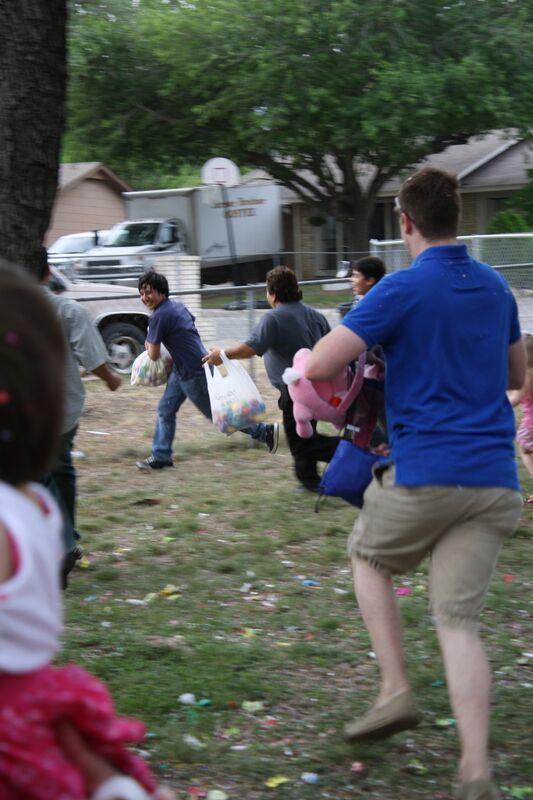 Then we each grab a bag and start grabbing the cascarones as quickly as we can because mayhem is about to ensue. What do you do with a cascarone, you ask? You break them over each other’s heads. 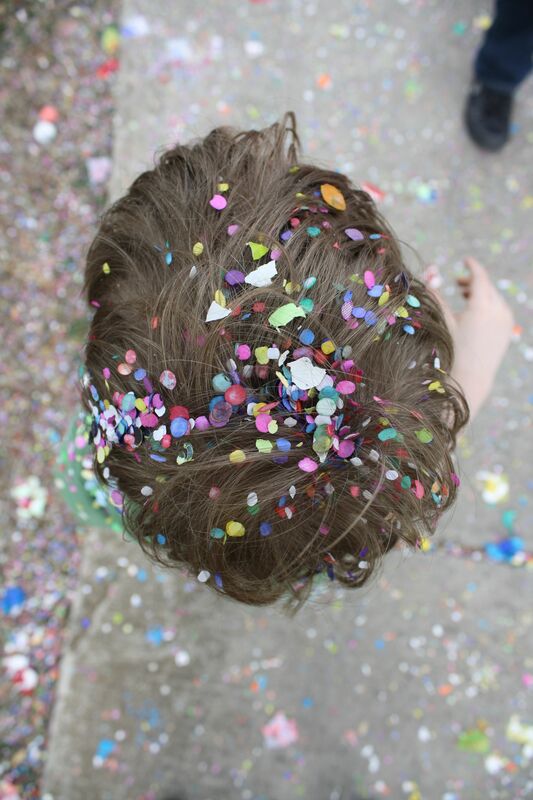 The result is happy kids who look like they’ve had a party in their hair. 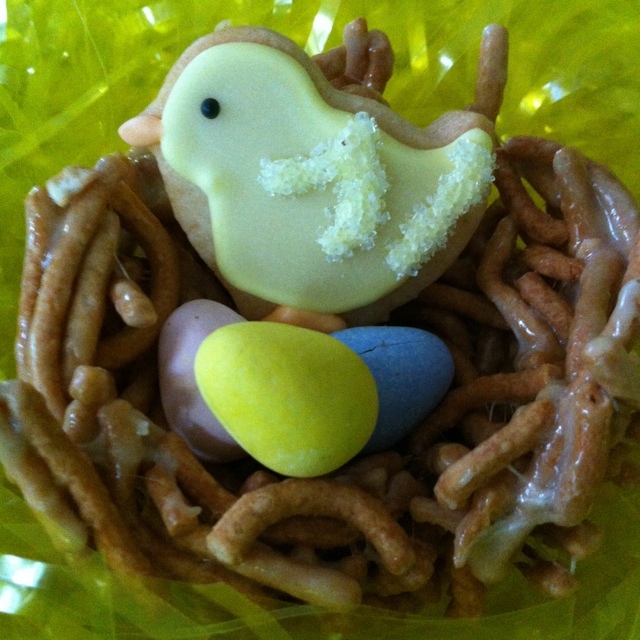 So what Easter traditions do you celebrate with your family? Big family dinner, egg hunt, special dresses? If you want to read about more Easter traditions hop on over to Hershey’s Bunny Trail to uncover holiday recipes, craft projects and inspiration for Easter baskets. The Bloom Blog was not compensated for this post other than an Easter basket that Hershey’s is sending me on March 30. I’m not sure if I will share the chocolate since Sunbeam and Firecracker always score their own Easter basket haul. 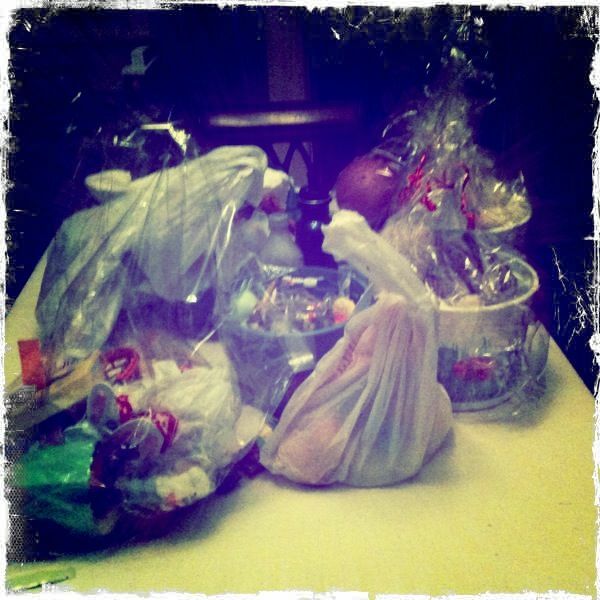 Sunbeam and Firecracker's 2011 Easter haul.